Agglomerate flooring is a man-made stone or tile that consists of stone pieces and/or aggregates held together in a resin. Most agglomerate tile has the same characteristics as the type of stone used in the matrix, and is frequently classified as granite, quartz or marble. Agglomerate marble flooring is created by mixing natural marble with a resin. It delivers the aesthetics of natural stone, is more durable and requires less maintenance than natural marble. It is a popular material for flooring and walls in large commercial environments such as shopping centers, hotels, and business lobbies. 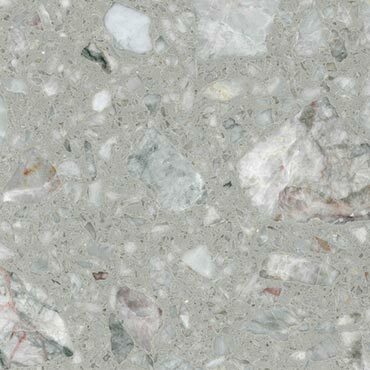 Agglomerate quartz flooring is a composite of natural quartz minerals and rocks bound with resin, pigments and other fillers. It is a high-quality solid, non-porous surface resistant to scratches, staining, water and heat. Minimal maintenance is required. It is used in a variety of commercial interior applications including flooring, vertical applications, stairs, food service counters and cash wraps.